Are you looking to play a ball game for a large number of friends this holiday? Dodgeball is the best fit. This game is fun, both indoor and outdoor. The main objective while playing this game is to win your opponents by hitting the ball just below their knee from your side. 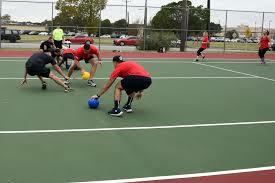 Dodgeball is amongst the few team building games that require little or no materials for preparation; you can quickly set it up with just a few materials. However, the number matter; at least 20 persons are required to make the best of this game; whereas, a lesser number of persons can still play effectively. Step 1: First, get a venue. You don’t just come up with any place. When playing outdoors, check out for areas with plane surfaces and fewer risks. Otherwise, a hall will be great to play this game! The playground is then divided into two equal parts by a marking ribbon. ‍Step 2: Participants should split into two equal teams. Each team is to take apart the divided floor, while they pose as opponents to the other team. The ball should be passed to a team to start the game; there’s no compulsory routine to know which team handles the ball first, but if it poses as a challenge, chose any random. Step 3: The target of each team is t win the opposers by getting the ball to hit your opponents just below there knee level. Each team throws the ball from there different side to ensure organization. Step 4: One touched, the player should surrender to notify and automatically eliminated. Other players will continue until any team is eliminated and the surviving team immerges winners. After the first round, you can reshuffle or choose entirely new teammates. Where the platform doesn’t support this description, you can form arrange all participants in a circle and take seats. The goal of this course is to defend your seat and yourself from the balls. You don’t need any particular skill or material to win in Dodgeball Games; concentrate and employ great caution to ensure you’re not hit. Always aim from the closest opponent for accurate shots. If you can apply a good tactic from start, then you have a greater chance of winning the game.